This encyclopaedia entry looks at the changing relationship between clinical and cultural representations of x-rays from 1895 until the present day, encompassing courting skeletons, frogs’ knees, floral radiography, x-ray eyes and more. . . . By the introduction of the NHS in 1948, x-ray technology had improved substantially from its first uses in the late nineteenth and early twentieth centuries, and the x-ray became increasingly crucial to medical diagnosis. However, in culture, throughout these 120-odd years from 1895 onwards, representations of x-rays have simultaneously been both hopeful and fearful, comic and tragic, and indeed symbolic of broader relationships between British people, technology and health. X-rays were first named in the late nineteenth century, in ‘A New Kind of Ray’ (1895), by Wilhelm Röentgen (a Professor of Physics and Director of the Physical Institute at Würzburg University). The first photograph taken by x-ray captured an image of the hand of Röentgen’s wife who, apparently, exclaimed with shock that: ‘I have seen my death!’ In Britain, the following years saw great regional variation in the uptake of this new technology, depending on available funds and practitioners, and also because many doctors believed that existing diagnostic techniques were adequate (for example physical examination, transillumination, cystoscopy and endoscopy). In popular culture, however, interest in x-rays was immediate and widespread. Like Röentgen’s wife, many Britons were shocked but also intrigued by the x-ray. X-ray machines were incredibly popular at travelling fairs, where members of public could view a version of their insides, and could also take home printed portraits of their own hands. Artists began ‘floral radiography’ in the 1910s, which developed further in fine art in the 1930s, and during the 1960s and 1970s, and continues today (though the process is now seen by some critics as a tad clichéd). X-rays were captured by film-makers also, and further disseminated to clinicians and public through this medium. The first film of an x-ray was made by Dr John Macintyre of the Glasgow Royal Infirmary. Macintyre x-rayed the moving knee of a frog, and also the movement of food through a man’s stomach. 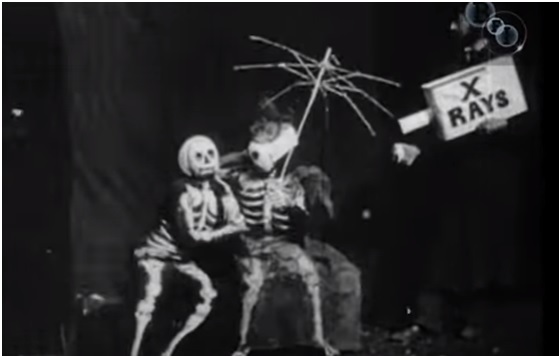 X-rays were also the subject of a comedy short: G. A. Smith’s The X-Rays (1897). This featured a courting couple, played by Smith’s own wife, Laura Bayley, and the comedian Tom Green. The couple cavort on a bench. When shot at by an ‘x-ray’, the pair are suddenly viewed as skeletons. As well as displaying excitement about this new technology, and its effects on daily and even romantic life, the short also deployed a new technology of its own: the jump cut, a type of film editing which allows shifts forward in time to appear as sequential. These two films thus captured the excitement of this age about the seemingly magical new technology, the x-ray. Watching these films now suggests that film-makers, whilst excited, were also deeply confused (or perhaps simply disinterested) in how exactly this new technology worked. Smith’s film, for example, displayed the x-ray machine simply as a white cardboard box with ‘X Rays’ written on. The x-ray box was carried easily, on one shoulder, by a man. Macintyre’s film displays the lack of knowledge, in this period, about the potential dangers of the x-ray: in the closing scene, a figure sits next to the man whose stomach is being x-rayed, without any concern for his proximity to the resultant radiation, or attempt to wear protective gear. From the earliest use of x-rays, some technicians and patients suffered from hair loss, dermatitis, and even severe injuries. Elizabeth Fleischman, for example, a pioneer of radiography, sadly died of radiation poisoning in 1905. Despite this and other cases, many clinicians denied the dangerous effects of radiation initially, because of the lack of research and evidence in this area. It was not until the 1920s and the 1930s that the use of x-rays became more regulated. In these decades, training courses were developed, safety protocols invented, and the profession of ‘x-ray operators’ was created and unified by the Society of Radiographers. By the time that the NHS was introduced in 1948, lay people no longer operated x-ray machines, and indeed radiographers had divided into sub-specialisms (notably therapeutic and diagnostic). The creation of nationalised health care facilitated the further standardisation of x-ray procedures and training regimes, and also enabled the amassing and comparison of data about x-ray use and efficacy. Early public information films promoted the NHS by portraying its innovative medical technologies, now available to everyone without cost for the first time. X-rays in particular were tied to early representations of the NHS by the NHS, and were the focus of public health campaigns around tuberculosis in the 1950s. In the 1960s, radiology became increasingly complex and expensive. Perhaps because the NHS remained free at the point of use, concerns about the cost of x-ray technology did not tend to filter into popular culture. What we see instead, in films and novels, is anxieties about what technologies such as the x-ray meant for humanity: anxieties which emerged concurrent with and through the rise in the genre of science fiction, and also amidst a growing crisis of public confidence in the medical profession. In X: The Man with the X-Ray Eyes (1963), the scientist Dr. Xavier develops eye drops which give him x-ray and ultraviolet vision. Initially, his new vision enables Xavier to save a young girl, by recognising an undiagnosed medical problem. However, Xavier’s new skills later drive him to madness, as he sees blinding lights at all times, and can find no respite from his constant stream of information and vision. Xavier accidentally kills a friend, goes on the run, and ultimately (spoiler alert??) removes his own eyes to avoid this hideous fate. Whilst the film initially represents the benefits of x-ray technology, and the potential of molding man and machine in transhumanist manner, it later warns about the limits and dangers of medicine, and how technology may change what it means to be human. As time progressed, and certainly by the 1990s and 2000s, the x-ray was no longer seen by the public nor clinicians as the most novel, new, or indeed threatening medical technology. Attention has perhaps shifted towards newer developments such as bionic limbs, gene editing, robotic healthcare professionals, and the growing of organs from stem cells, to take just a few disparate examples. In this context, the x-ray was often featured casually within popular culture, as a sideline, rather than as a central or novel plot feature in itself. In medical dramas such as Casualty and Holby City, and in reality television such as 24 Hours in A&E, for example, the x-ray is used regularly, but the narrative focus is not on the operation of this technology, but rather on the emotional and social impact of a patient’s subsequent diagnosis and care. In other points of popular culture, however, the medium of the x-ray continues to be identified as something special and unusual. In the James Bond film The World is Not Enough (1999), the x-ray is presented as an exciting part of Bond’s ‘spy gadgetry’, when the protagonist uses x-ray glasses at a casino to identify concealed weapons (and also to look through the clothes of female staff. . .). Some artists also now use x-rays to produce radical art. Diane Covert, for example, documents and displays x-ray images from people in Jerusalem who have been injured by war and in terrorist attacks. In Covert’s work, the x-ray makes visible the everyday objects placed into terrorist bombs, such as nuts and bolts. The stark contrast of the x-ray image in a way depersonalises the subject, evocative of the depersonalising effects of war. The images also invite empathy for the people unlucky enough to live in these conditions, who could be anyone. This use of art is very powerful, and the specific medium of the x-ray is crucial to its message. Covert’s art, using the x-ray as a call to action, is reminiscent of a period in the 1960s when paediatric radiologists used x-ray images of children’s broken bones to draw media and public attention to child maltreatment. The clinical and the cultural uses of x-rays have continued to intermesh and effect one another in recent years. For instance, since 2009 Hugh Turvey has been an artist in residence at the British Institute of Radiology, where he uses x-rays of ‘everyday objects’ to help patients to ‘understand the process that they are going to go through’. Culture has hence drawn on medicine for inspiration, yet artists have also shaped and influenced medical change and practice over time, as is seen more broadly in the Healing Arts movement. The x-ray therefore continues to be powerful in the twenty-first century, as well as, at times, taken for granted as part of the remarkable – and expensive – technological toolkit of the NHS. The x-ray is important in terms of clinical prevention and diagnosis, but also in cultural representations of pain and suffering, and in the social and cultural negotiation of anxieties about the limits and dangers of technology and humanity.